My husband will often call me in from my studio for dinner. I’m busy. I’m right in the middle of something, I respond. Or my brother will quip that I haven’t really retired but have just found another job. Yes, I agree. 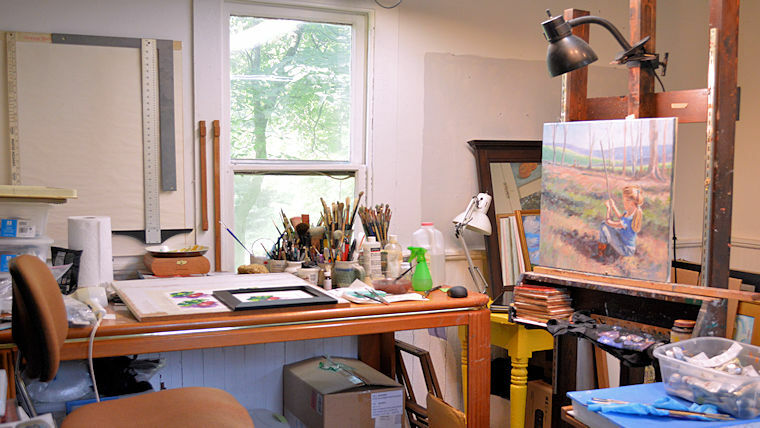 When I go out to my studio, a commute of about 30 feet, I am lost to the world. Music or recorded books. Ideas abound. Running out of something to paint or express is totally foreign to me. This does not mean that there are not challenges or some labor involved. I spent several days recently cleaning my studio. Let me be frank. Artists are pack rats. We can always think of something we can do with the flotsam and jetsam in the creative space. This could be useful. Maybe I’ll need this some day. Really! But, there comes a time to clean and to toss. I have spent plenty of time at the burn barrel…mostly with few regrets. Occasionally I think of something that I’ve gotten rid of and wish I had saved but it was probably for the best. And then there is the business side of art. Following up on e-mails and phone calls. Scheduling exhibits and competitions. Ordering supplies. Keeping up with the money…or lack thereof. Successful artists really pay attention to these details. So, yes, I’m retired and have a steady income stream. That is always a relief. But the more important thing is that I just get to do what I want with my time. And I want to create art. That’s enough. It’s not work. This entry was posted in art, opinion and tagged art, kit miracle, on being an artist, work. Bookmark the permalink. Thanks for your great thoughts, Kit! You have reminded us all that without that which makes us happy, we loose out in life.